Apples and Butter: Decisions, Decisions. 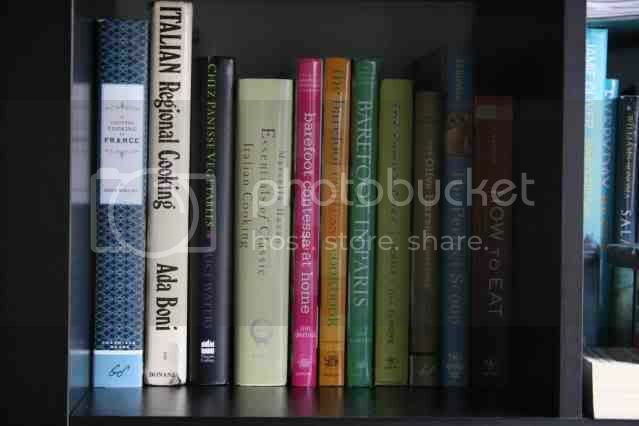 At last count my cookbook collection had grown to include between 80 and 90 books. Even if you don't live in New York, which I still do not, you probably have at least heard about the size of New York apartments. I lucked out with my place. It is the only apartment I looked at that had a full-size stove and fridge. Unfortunately, that is where you must stop using the words full and size to describe anything in my apartment. So, sadly, I must leave the majority of my cookbooks at home. My boyfriend has agreed to hold onto the surplus of books. I would like to believe he is doing this out of the kindness of his heart, but I have a feeling his motivations have more to do with the leverage he will have when trying to convince me to come home at the end of a year. My dilemma now lies in trying to decide which 10 books come with me. How do you whittle down a collection of 90 to just 10 books? As I stare at the pile of half-packed boxes sitting in my living room, this question is just a bit too overwhelming. I need your help. If you were moving across the country and could take just one book with you, what book would that be? i know what a tough question that is. for me, right now, it would be either the zuni cafe cookbook or my canal house books. good luck! Leave them all. You'll be back. It is an excuse to buy new ones at the various fabulous used book stores in your new city. Buy your ten here, that way, you won't even have to carry them and your new mini culinary library will be such a sweet reminder of your time in our great city. Yes? YES! Ideas: (1) Scan favorite recipes from your collection and save the files on your computer, assuming you take one of those. (2) Compare your collection with the NYC public library catalog online and take the ones that you would need to use all the time and/or the ones that you could not get from the library. Personally, I would take 1 or 2 of the big comprehensive ones. I like the Gourmet Cookbook and Bittman's How to Cook Everything. I'd take my battered copy of Joy of Cooking as a reference manual of sorts. That being said, you can look so much up on the internet, I bet you could survive with zero cookbooks. Also, there's always the library. You'll be just fine. Happy planning. Hmmmm....I guess it's a question of favorite vs. most useful. If I were to pick favorite...Apples by Jam by Tessa Kiros, for its sheer beauty and homey-ness. But most useful? Maybe The Art of Simple Food by Alice Waters. Good luck...that is TOUGH! I feel your pain. Except I left ALL my books behind when I moved to Paris. What do I most wish I had? Probably How to Cook Everything (another vote for that one!) or Joy of Cooking as general references. I also miss The Bread Baker's Apprentice, The Last Course (Claudia Fleming), and Sunday Suppers at Lucques. I remember when I was in culinary school, I used The Silver Palate Cookbook quite a bit for homework, research, and inspiration. In recent years, I've found that a web subscription to Cook's Illustrated is very handy, indeed, in lieu of piles and piles of books. Great question. My wife would take How to cook everything vegetarian. I would take a cookbook that we have made by ripping recipes out of magazines and stuffing them in plastic protectors. This might be a cop out answer but it is the best cookbook we have. For me it would be Marcella Hazan's The Classic Italian Cookbook. But I agree that you could find whatever you need on the internet; and if you find you absolutely cannot live without a book, your boyfriend can always send it to you. Enjoy your new adventure. Oh man - what a task. I'm not even sure where I would. If you're methodical about it, you can separate your books into different genres and take one from each. For me though, I would start with an Ina Garten book since she is my favorite. I faced the same problem when I moved from Cali to NYC. I took the Joy of Cooking, Gourmet (the yellow one) and a couple illustrated ones that are fun to look at. I agree with the others-- take a couple bibles and pick up the fun, illustrated ones once you arrive. Wow. That is hard. I'm in the process of moving and can only have a portion of my cookbooks with me. I took the oldest ones, the ones I've wanted to cook from the longest. Then when I could bring more, I took the smallest ones so I could bring more. Good luck choosing. Late to this but congratulations on your upcoming adventure. I'd make a tastebook or something similar with my favorite recipes from various books. Or I'd get lazy and take Nigella Lawson's How to Eat. One? Yikes. I second what someone said about Alice Water's Art of Simple book. As I look at my shelf, I also think Silver Palate Goodtimes Cookbook would be right up there. Though many of the recipes are not simple, I love the format and how it flows through the holidays of a year. I love all the photos, but the tomatoes and corn is the best. It looks luscious. How do I become a follower - I can't find the prompt.